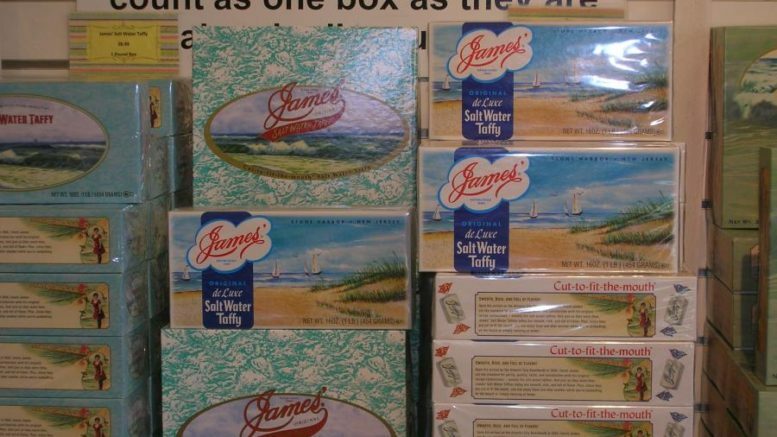 It may not mean much to someone from Houston, Texas or San Francisco, California, but to the many generations who lived on the East Coast and visited or vacationed in Atlantic City, N.J., or nearby communities, the remembrance of James Salt Water Taffy and Fralinger’s Salt Water Taffy, which is owned by the same company, was never to be forgotten. Like all good memories, they remain with us forever. Well, after 138 years, the James Candy Co. has filed for Chapter 11 bankruptcy protection citing the rainy weather that reduced the number of visitors this past summer after more than a decade of declining Boardwalk visitors and salesmen. There’s much to recall about Atlantic City and salt water taffy, which was named the state’s official candy a few years back (see “Will Salt Water Taffy Become NJ’s State Candy?” It appeared in Beau’s Corner June 5, 2014). A news release from the company said that the James Candy Co. plans to continue payment of employee wages, benefits, vendors and suppliers in the ordinary course for all goods and services provided on or after the filing date. The hope is that Chapter 11 protection will enable the company to return to a profitable position in the future.